The ImmuneSchein Tea Haus is having its one-year anniversary celebration on Saturday, April 9. The Tea Haus is open from 9am to 6pm. Free tea and cookies will be served, and there will also be a flea market outside from 11am until 5pm. This event is a collaborative celebration with Yoga Yoga, which is celebrating its third year as a studio in Rosendale. 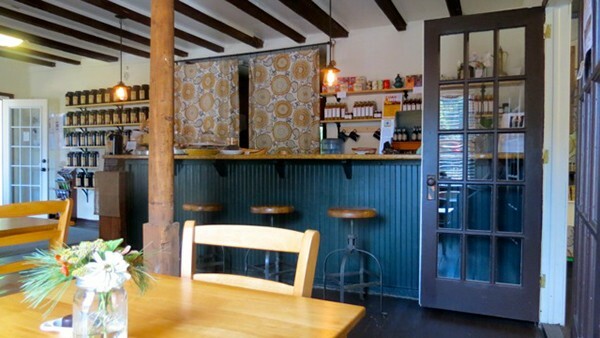 Last April, the ImmuneSchein Tea Haus opened on Main Street in Rosendale. ImmuneSchein is the creation of local Hudson Valley residents Corinna and Jason Geib. Corinna, originally from Germany, grew up learning about health and healing from her grandfather. Her idea for the ImmuneSchein elixirs came from her time spent learning herbal traditions from him. With three simple ingredients—organic ginger, organic lemon, and New York State wildflower honey—these elixirs promote digestive health, improve circulation, and decrease inflammation in the body. 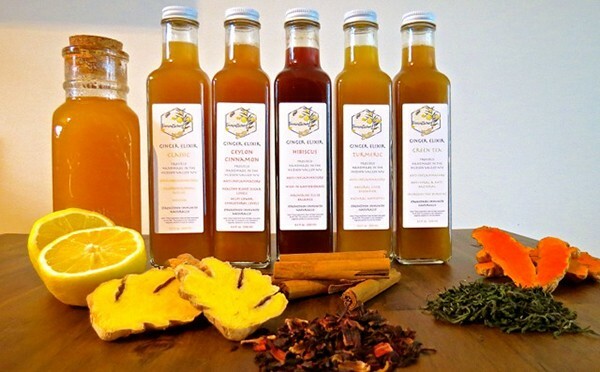 She and Jason have expanded their selection by adding additional organic ingredients, creating a total of six elixirs: Classic, Turmeric, Hibiscus, Green Tea, Ceylon Cinnamon, and Lavender. Each elixir has its own specific healing qualities. There is also a seasonal Garlic elixir, which makes its way to the shelves each fall. 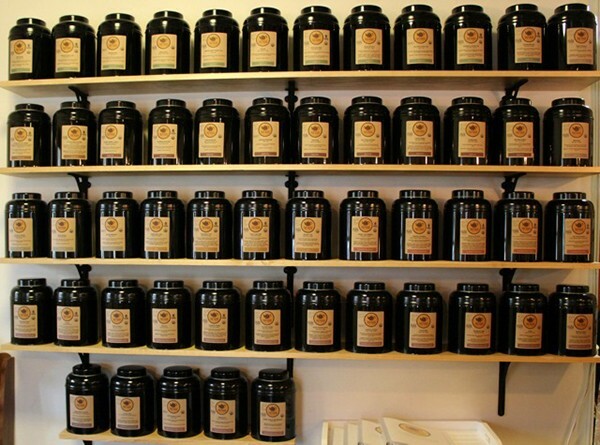 The Tea Haus offers over sixty varieties of loose-leaf, organic tea—from Tropical Coconut Oolong to Moroccan Mint to Valerian Dream. The Tea Haus also features special seasonal tea blends, such as Turmeric Chai, Chilean Sunset, and Tulsi Chai. There is an assortment of homemade foods from sellers based throughout the Hudson Valley—including gluten-free coffee cake, oat bars, and rainbow cookies from Bearsville Bakers, as well as seasonal quiches, such as sweet potato and goat cheese, and galettes, like last week’s leek, ricotta, and fennel, from Curbside Cuisine in New Paltz. The forks, the knives, and the spoons are all made from wood and are compostable. The plates, which are made from bamboo, are also composted. 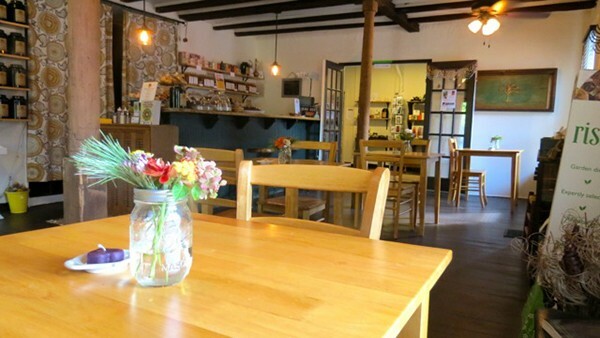 Creating a warm place where friends and strangers can converge, the Tea Haus offers a cozy, relaxing space that is hard to find within the busy pace of our lives. It is nearly impossible to leave without striking up a conversation. Every first and third Wednesday of the month there is an open mic night from 7pm to 10pm hosted by local musician and artist Eric Archer. The intimate creative gathering attracts diverse performers, musicians, poets, dancers, and instruments—ranging from the Japanese koto to the North Indian sitar and tabla to the hang drum.